One of the great things about booze blogging is the lovely people I’ve met, from the London based whisky gang to the overseas posse who I speak to through a combination of blog comments, emails and twitter. One of them is Lucas of the Edinburgh Whisky Blog. He’s been doing some online PR stuff for Inver House for a little while, and through him I’ve got a taste of some Hankey Bannister and anCnoc as well as a spot on a Balblair twitter tasting, but due to the vagaries of my annoyingly full schedule I’ve missed out on their most recent online gatherings – especially galling was my missing an Old Pulteney one. I tried Pulteney for the first time in a while last year at a tasting put on by The Whisky Exchange and remembered how much I liked it, even if I found the quick ramping up in price with age slightly off putting, and have had a couple of bottles of the regular 12 year old pass through my door since. However, I’d not returned to the wider range until I picked up a bottle of WK499 in the duty free shop on my way to Porto in February and have been meaning to revisit them when I got a chance. As such I was rather pleased when Lucas pinged me a mail asking if I wanted to come along to a bloggers tasting at the new Boisdale’s bar that opened last week in Canary Wharf. I wrote a pile about Old Pulteney last time, so I won’t dig into that again here, but instead will go straight on to the whisky. 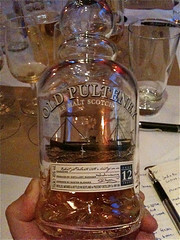 First up was the solid centre of the range, Old Pulteney 12 year old. This is their best selling whisky, putting out ~600k cases per year split half/half between the UK and the export market. On the nose it’s briney with gingery spice and a punch of booze. There’s also lemon, sweet nail varnish, grain and a hint of something that was on the edge of parma violets. To taste it was much softer than the rather up front nose suggested, with butter, sponge cake, sweet cream, light lemony citrus, sour fruit chews, and a mineral and damp wood finish. Water added an icing sugar sweetness and more sour fruit, as well as some tannins into the finish. 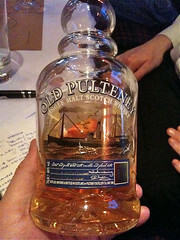 We then moved on to the Old Pulteney 17 year old. Rather than just bottle the 12 year old recipe a little bit later the folk at Pulteney have instead opted to change each of the entries in their line-up to give a whisky with a different idea, although all coming from the same new make spirit. 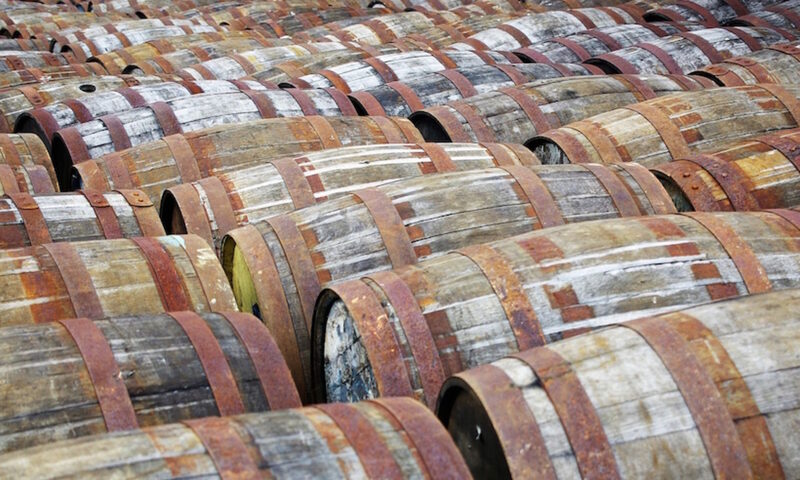 The 17 year old is made up of less first fill casks than the 12, giving it a lighter colour as well as body. On the nose there was vanilla, dried apple rings, sweet butter, cold butter icing, sweet lemons and toffee apples. To taste it had a syrupy sweetness to start, cut with woody spices and citrus – sweet lemon flesh and bitter lemon rind. It was sweetly buttery and had a bitter woody finish that faded to soft wood. Water added a bit more of a sherbet fizz and moved the finish from bitter to sour, with a sweet woody burn sitting on the chest. Next up was the Old Pulteney 21 year old. This one has some more sherry wood in the make up (although Pulteney only mature about 10% of their whisky in ex-sherry casks) and as soon as noses went into glasses there was a call of ‘Shreddies’ from Joel Caskstrength and Ben from Master of Malt. Lucas chipped in with Happy Cola Haribo, brandy butter and ripe bananas. I saw were they were coming from but got more juicy raisin, butter and rich meatiness underneath it all. There were also the citrus notes that carried through the other whiskies, in this case more like the smell left on your fingers after squeezing a lemon wedge. To taste there was some unripe red grape, syrup sweetness, lemon cake and a hint of struck match sulphur on the woody finish. Water brought out more lemon on the nose and killed some of the sweetness, bringing in more soured fruit. We next tried the Old Pulteney 30 year old. This was released in 2009 and took the 17 year old’s approach to wood, with predominantly 2nd and 3rd fill casks used to mature the whisky. On the nose there was crisp red apple skin, salty butter, polished wood, green veg, gravel and foam bananas. To taste the vegetal nature came through as a hint of nettles, with sour fruit and sweet fake fruit. As it sat in the glass it got sweeter, with ripe bananas sitting around into the finish. Water brought out more sweetness and vanilla (plain cupcakes?) but killed the depth of flavour quite quickly, although it did add some fruit stone bitterness to cut the sweet finish. 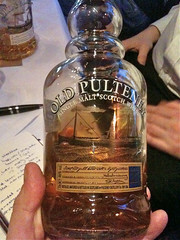 Last on the mat for the evening was a special treat – Old Pulteney 40 year old. This was extra specially special as pretty much noone could have had a chance to taste it as it was only racked a week earlier, made up of three sherry hogsheads and an ex-bourbon cask from 1968. The sample bottle that Lucas brought with him was at 53.4% but they predict that this will have dropped to 52.5% by the time it’s bottled later this year. On the nose I got the nettle vegetal notes from the 30 year old, randomly expanded while talking to Joel to be ‘foraged plant matter’, as well as sweet cocoa, buttery marzipan, thick red fruit, red wine, sweet orange marmalade, floury red apples and a touch of sour cherry. To taste the orange came to the fore, with hints of Fry’s Orange Cream leading to a buttery wood and Seville orange finish. In between there was leather, tobacco boxes and green veg. They’re still finalising the packaging, which Lucas wouldn’t even give us a hint about, but the release should be ‘imminent’. It won’t be cheap but it’s definitely worth a try.